Russia will not go to war with the people of Ukraine, but will use its troops to protect citizens, if radicals with clout in Kiev now try to use violence against Ukrainian civilians, particularly ethnic Russians, Putin told the media. Putin, who was given a mandate by the Russian senate to use military force to protect civilians in Ukraine, said there is no need for such an action yet. Putin cited the actions of radical activists in Ukraine, including the chaining of a governor to a stage as public humiliation and the killing of a technician during an opposition siege of the Party of Regions HQ, as justification for Russia to be concerned for the lives and well-being of people in eastern and southern Ukraine. Incidents like those are why Russia reserves the option of troop deployment on the table. “If we see this lawlessness starting in eastern regions, if the people ask us for help – in addition to a plea from a legitimate president, which we already have – then we reserve the right to use all the means we possess to protect those citizens. And we consider it quite legitimate,” he said. Russia is not planning to go to war with the Ukrainian people, Putin stressed, when a journalist asked if he was afraid of war. But Russian troops would prevent any attempts to target Ukrainian civilians, should they be deployed. Putin dismissed the notion that the uniformed armed people without insignia who are currently present in Crimea are Russian soldiers. He said they are members of the Crimean self-defense forces and that they are no better equipped and trained than some radical fighters who took part in the ousting of Yanukovich. He assured that the surprise military drills in Russia’s west which ended on Tuesday had nothing to do with the Ukrainian situation. “Generally, I believe that only residents of a given country who have freedom of will and are in complete safety can and should determine their future. If this right was granted to the Albanians in Kosovo, if this was made possible in many different parts of the world, then nobody has ruled out the right of nations to self-determination, which, as far as I know, is fixed by several UN documents. However, we will in no way provoke any such decision and will not perpetuate such sentiments,” Putin stressed. Asked about criticism of Russia over its stance on Ukraine, Putin dismissed the accusations that Russia is acting illegitimately. He stated that even if Russia does use force in Ukraine, it would not violate international law. At the same time he accused the United States and its allies of having no regard to legitimacy when they use military force in pursuit of their own national interests. “When I ask them ‘Do you believe you do everything legitimately,’ they say ‘Yes.’ And I have to remind them about the US actions in Afghanistan, Iraq and Libya, where they acted either without any UN Security Council mandate or through perverting a mandate, as was the case in Libya,” Putin said. “Our partners, especially in the United States, always clearly formulate for themselves their geopolitical and national interests, pursue them relentlessly and then drag the rest of the world in, using the principle ‘You are either with us or against us.' And harass those who refuse to be dragged in,” he added. As for the sanctions Russia faces over Ukraine, Putin said those threatening them should think of the consequences to themselves if they follow that path. In an interconnected world a country may hurt another country if it wishes, but it would be damaged too. Threats are counterproductive in this situation, Putin warned. He added that if G8 members choose not to go to Sochi for a planned G8 summit, that would be up to them. Putin stressed that the Ukrainian people had a legitimate reason to protest against Yanukovich’s power, considering the overwhelming corruption and other faults of his presidency. But he objected to the illegitimate way his ouster took place, because it undermined the political stability in the country. “I strictly object to this form [of transition of power] in Ukraine, and anywhere in the post-Soviet space. This does not help nurturing a culture of law. If someone is allowed to act this way, then everyone is allowed to. And this means chaos. That’s the worst thing that can happen to a country with an unstable economy and an unestablished political system,” Putin explained. He said that while he personally was not fond of months-long streets protests as a means to pressure the government, he sympathized with the Maidan demonstration members, who were genuinely outraged with the situation in Ukraine. But at the same time he warned that what happens in Ukraine now may be a replacement of one group of crooks with another, citing the appointments of certain wealthy businessmen with questionable reputations. Asked about the presence of snipers during the violent confrontation in Kiev last month, Putin said he was not aware of any order from the Yanukovich government to use firearms against the protesters. He alleged that the shooters could have been provocateurs from one of the opposition forces. He added that what he was sure of is the fact that police officers were shot at with lethal arms during the confrontation. Yanukovich is certainly powerless in Ukraine, but legally speaking he is the legitimate president of the country, Putin said. The way the new authorities in Kiev replaced him did not enhance their credibility. Asked if he felt for Yanukovich, Putin said “Oh, no. I have absolutely different feelings.” But he declined to publicly explain what those were. He also refrained from commenting on what mistakes he saw in Yanukovich’s actions, explaining that it would not be proper for him to do so. At the same time Putin does not see any political future for Yanukovich, which he told the ousted Ukrainian president himself. He added that Russia allowed him to come to its territory for humanitarian reasons, because if he remained in Ukraine he could have been summarily executed. The Russian government is currently engaging with the self-proclaimed govern of Ukraine with the goal of preserving economic ties between the two countries. However, any normal relations would only be possible after Ukraine has fully legitimate branches of government, Putin said. He considers that he has no counterpart in Kiev now, so he personally has no partner to communicate with. The Russian president stressed that Russia wants to see equal participation of all citizens of Ukraine in defining the future of the country. The resistance to the authorities in Kiev, which is evident currently in the eastern and southern Ukraine, shows clearly that currently Kiev does not have a nationwide mandate to govern the country. 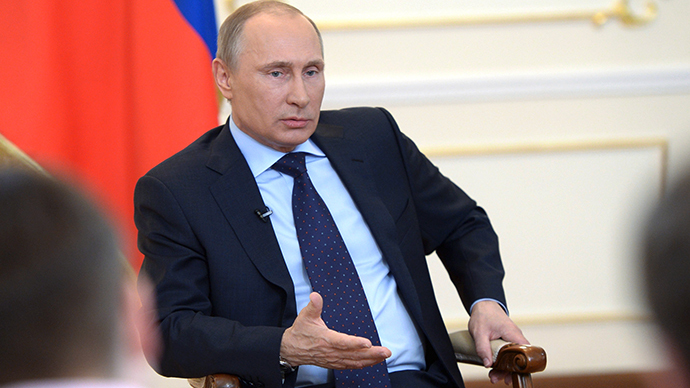 Russia will be watching the planned presidential election in Ukraine, Putin said. If it is conducted in an atmosphere of terror, Russia will consider it unfair and will not recognize its results, he warned. Putin commented on the issue of Ukraine’s territorial integrity, which Russia committed to preserve. He said that Western powers reject Russia’s assessment of the events in Ukraine as a coup and insist on calling it a revolution. Some Russian experts, Putin warned that if Ukraine had undergone a revolution, then the nation that came out of it is not the same that it was before, similarly to how Russia transformed after the Bolshevik Revolution in 1917. If this is the case, Moscow may consider itself no longer bound by any treaties it has with Ukraine, Putin warned.